Saturday afternoon the Daily Pilot, via their excellent reporter Bradley Zint, provided its readers with a profile of the most recent Costa Mesan to enter the local political blogosphere, Dennis Popp. You can read it HERE. Zint does a good job of providing a biographical profile of Popp, so I'm not going to attempt to expand on that. 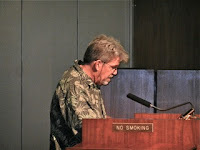 I thought his profile and description of Popp's blog, Costa Mesa Politics and Personalities, was pretty darn close, as was his inclusion of vignettes of this blog and one produced by the grumpy old guy, The Mouth From Mesa North. While I seldom link to the putrefaction found on his blog, you can read his take on Zint's piece HERE. Warning: You may have to take a shower after reading that entry. As you might expect, I take exception to much of what Popp writes, beginning with the preamble at the top of his page. He says, "The aim of this blog is to fit into the blogosphere like the bracingly tart taste of yogurt fits between the boringly bland and the unspeakably vile." In my view, so far, he has failed. Nothing I've read on his blog for the year he's been publishing resembles a 'bracingly tart taste" of anything, although I must admit that sometimes it does remind me of fermented milk. No, I think he's still in that "boringly bland" stage. He then says, "All comments will be answered if their author provides contact info." And yet, he seldom permits comments to appear on his blog. Sometimes he will provide his few readers his version - a compilation - of what commenters have to say. I know from first-hand experience that managing comments on a blog is a sticky wicket. It's probably better if he just blocked comments to save himself the trouble of having to read them. He then gives us this whopper, "I have no sponsoring group(s) or agencies, and I owe no allegiance to any candidate or group." I can see the smirk on his face now... Really, Dennis? Do you actually read the stuff you write? How do you suppose you found yourself on city committees? You purchased those positions with your pandering prose. I suggest you just delete that phrase from your masthead, unless you don't mind folks thinking, "Just who does he think he's kidding?" as they begin to try to read your stuff. And I intended to say "try to read your stuff" because it is generally so boring that it's very difficult to figure out exactly what he's trying to say. Of course, he has the endorsement of those local intellectual powerhouses, Steve Mensinger and Jim Fitzpatrick, so that's really all that counts, right? Well, that and the fact that Popp likes kitties. I'm glad the Daily Pilot profiled my fellow geezer-blogger, Dennis Popp. He seems like a nice enough young fella. Some might say we'd make a perfect pair of bookends - two conservative, portly, gray-haird geezers. We both will continue to write what we write and let the chips fall where they may. He will continue to support the ill-conceived schemes his benefactors put forward and I'll continue to point out their foibles. He'll continue to pretend he's an intellectual and I will not. He'll continue to tell you he "has no sponsoring groups" and I'll continue to smile, recognizing that statement for the falsehood it is. He'll pretend he receives comments and I'll continue to welcome all views and post them to encourage a lively online discussion of important issues. Yeah, I know - since I required registration before posting comments most of the threads seem one-sided. I supposed you could presume that most of those nasty ones in the past were contributed by gutless anonymous posters representing views that oppose mine. Their comments are still welcome, I just want to know who they are... my blog, my rules. And, yes - I will protect their anonymity if they choose to register. So, welcome, Dennis. If Zint's quote near the end of the article is correct, I guess I either get the credit or blame for his presence in the local blogosphere. I will say, "You're welcome" or "I'm sorry", depending on your viewpoint. 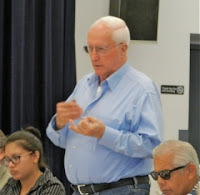 We will do our things and the grumpy old guy from Mesa North - so filled with hatred that he has become virtually irrelevant in the serious discussion of issues in our city - will likely just disappear in a puff of smoke one day like the Wicked Witch Of The West in The Wizard of OZ. Now, if you'll excuse me - I have to go feed the pit bull a small kitten. Remember, you MUST register BEFORE you attempt to post a comment on this blog. Click HERE for the details. In the ongoing drama of who did what to the now-infamous Vernal Pool #6, Friday afternoon Costa Mesa CEO Tom Hatch announced a plan to install temporary ropes around it where it abuts the fence that separates Fairview Park and Parsons Field. He goes on to say that a park ambassador will direct visitors and their parents who use a nearby sports field around the protected area. You can read his entire statement HERE. 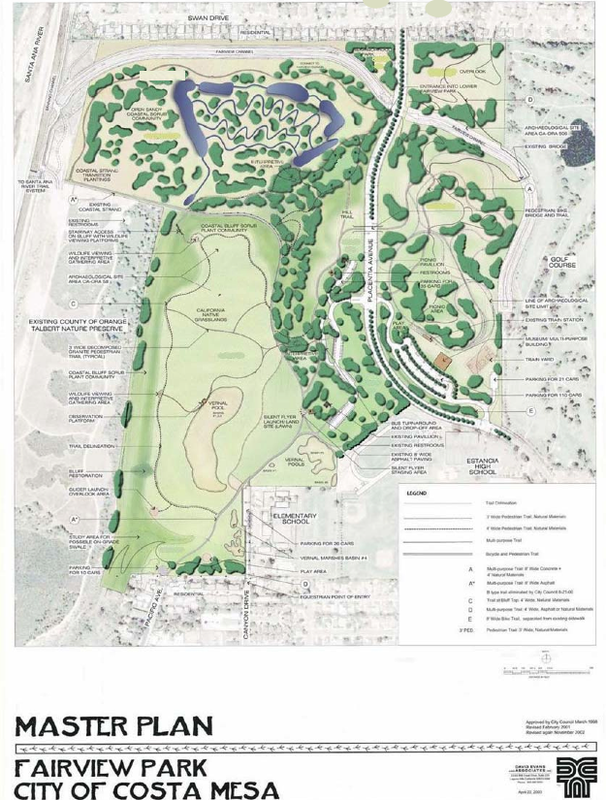 This is going to be very interesting, since there doesn't seem to be any good way around the now-defiled pool without tromping over a similar area at what is known as Vernal Pool #5. It's truly unfortunate that the city failed to fulfill its custodial responsibilities and mark the pools more than 15 years ago as was agreed with the federal government. You can read some of the various agreements as listed HERE. If the city had been more diligent in years past it's likely that this whole mess might not have ever occurred because the pools and the required 10 foot buffers would have been clearly delineated. It's too late now. 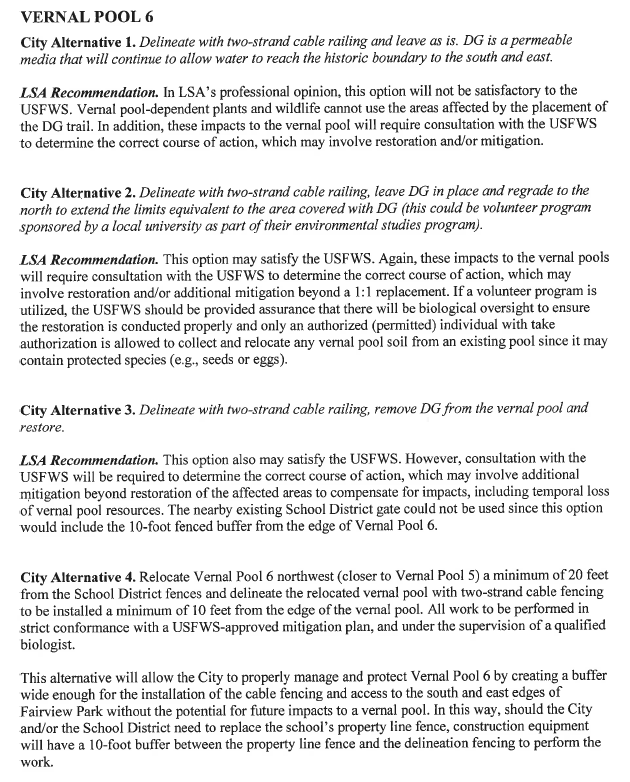 In an earlier post we discussed the letter that had been sent to the United States Fish and Wildlife Service (USFWS) which included several potential mitigation measures for the segment of Vernal Pool #6 that has been destroyed by the decomposed granite (DG) path. You can read the entirety of that communication HERE. 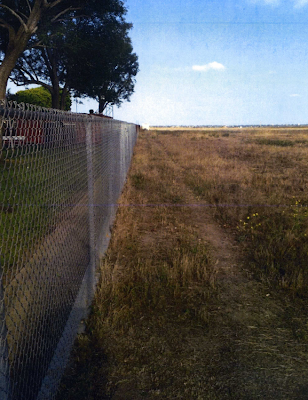 The fact remains that this mess began with a request by Mayor Pro Tem Steve Mensinger to abate weeds along a user-defined trail that ran parallel to the fence in question about four feet out into Fairview Park. 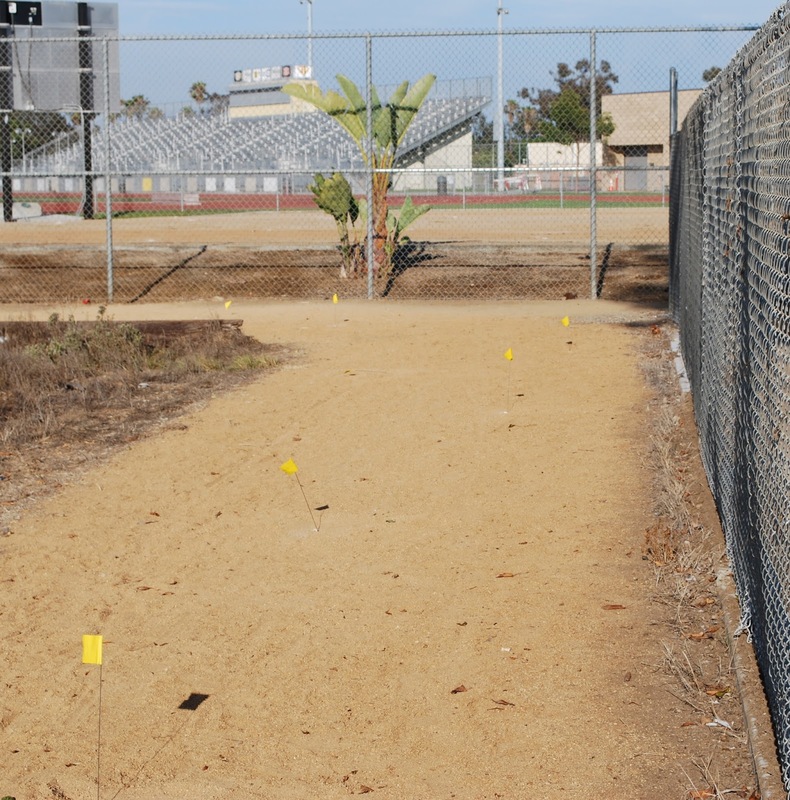 That trail encroached into Vernal Pool #6 at the fence line near Jim Scott Stadium. To date, as far as I know, nobody has taken responsibility for the installation of the DG path. However, investigations continue into this matter and it is VERY likely that the identity of those responsible will soon be known. In my view, it would be far better for them to step up, admit their error and offer to assist in whatever mitigation measures are determined to be necessary and required by the federal government. This morning, at a time when, according to my sweet and very patient wife, I was softly snoring, Costa Mesa Mayor Jim Righeimer was performing one of his stand-up routines before a group of mostly Newport Beach residents at a breakfast meeting of the Newport Beach Chamber of Commerce. According to the lovely and talented Antonie Boessenkool of the Orange County Register, HERE, he told the assembled crowd, "I have no doubt that at the end of the day, we will have a charter on the ballot." He later apparently told the audience, "It's going to pass. It also gives us a lot more leverage to do things right." 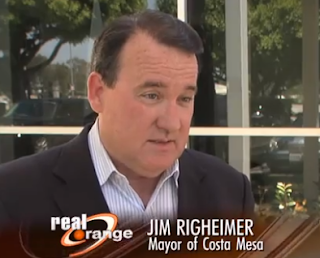 According to Boessenkool's article, Righeimer chided Newport Beach Mayor, Keith Curry, saying "Curry, you've got it made over here." Ever the class act, our mayor. Although I wasn't there, I suspect our friends in Newport Beach felt a whole lot better about Curry as their mayor after watching Righeimer's act. He also apparently said, "We want to manage the city. The (employee) associations and their contracts can't manage the city." This is typical of Righeimer, as he struts and sputters before any crowd, camera, reporter or any small group he encounters. This is his campaign modus operandi and he's clearly on the campaign trail for his re-election next year. To describe him as "cocky" seems inadequate. I'm thinking that "arrogant" best describes him. You tell me... here's the Dictionary.com definition of arrogance: offensive display of superiority or self-importance; overbearing pride. That sounds about right to me. Despite having his charter soundly thumped at the polls last November, he arrogantly demanded another drink from the bowl. He demanded that a charter committee, not a commission, be created, then promptly stacked it with folks who follow his mantra like so many lemmings. I have no doubt that when the process is complete there WILL be a charter. I also don't doubt that Righeimer and his majority on the council will tinker with it to get his pet projects included before it is placed on the November ballot. He apparently thinks the facade of fairness - the committee, which is subservient to the council - will actually sway the electorate the next time. He thinks it was all about him last time around... it wasn't. It was the charter he cobbled together all by himself to be sure his pet peeves were included. The voters didn't just say "No", but they, with a 60-40% walloping, said "Heck, No! ", or words to that effect. ANOTHER YEAR OF THIS? GEEZ! So, as the campaign season now unfolds, it's going to be interesting to watch Righeimer posture, prance, pontificate and pander to the voters for the next fourteen months. It ain't gonna be pretty! Last night was a crap shoot... I had to choose between the latest meeting of the Fairview Park Citizens Advisory Committee meeting and the Westside Master Plan Community Outreach meeting, both of which were held in the same venue - the Neighborhood Community Center - at the same time. Primarily because of the controversy embroiling Fairview Park issues, I chose the former. The meeting was well-attended - at least 30 people showed up and a third of them chose to speak to the committee. I thought that was a good sign and hope even more people will attend the next meeting on October 2nd at the same venue. 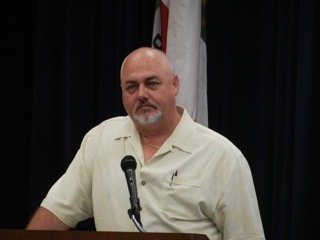 The first speaker was Gordon Bowley of Costa Mesa United. 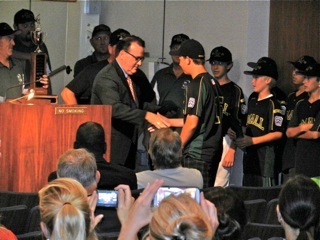 He asked to be placed on the agenda for the next meeting so he could address the committee on youth sports. 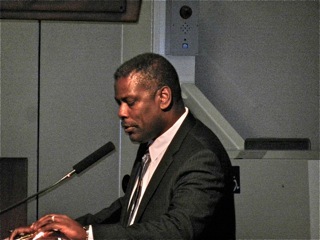 He was the first speaker and formed part of a pro-sports fields bracketing, with Devin Lucas speaking last and stressing the need for more playing fields. 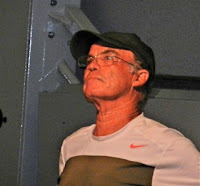 Harold Weitzberg again stressed the need to carefully evaluate whether ANYTHING needs to be done in the park. He encouraged the group to carefully assess the need for playing fields, for example. He implied that the demographics may not support more fields. Several of the speakers were very concerned about the plans for the new parking lot and play area off Pacific Avenue, stressing congestion on an already-crowded narrow street. They also spoke of the need for a restroom near the proposed playground. 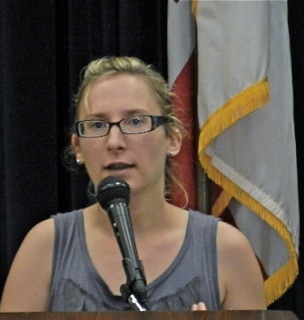 One speaker, Jordan Strickland, told the group and audience that Mayor Jim Righeimer will be holding a "Meet the Mayor" meeting at his, Strickland's" house on September 12th at 6:00 p.m. to discuss those very improvements. His address is 2303 Pacific Avenue - last house on the left at the end of Pacific. Watch for the announcement on the city web site. 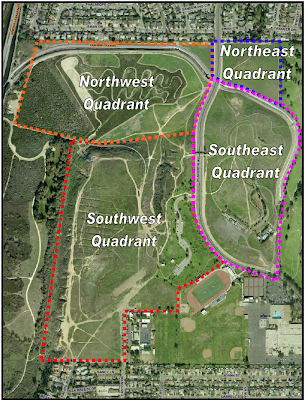 Then Bart Mejia, Project Manager for Fairview Park, presented an overview of the Northeast Quadrant of the park - the section off Placentia and bracketed by the Fairview Channel and the homes up the hill to the north. It's a relatively small segment of the park and right now is just the home to an overlook site. There was NO discussion of possible enhanced uses of this quadrant - those suggestions will come later in the process. 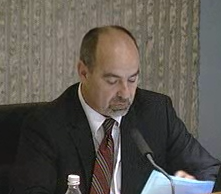 During Member Comments Brett Eckles expressed an opposing viewpoint to that expressed by Weitzberg. He stressed we NEED more fields. Dennis Popp echoed Eckles and suggested that folks seeking assistance from committee members be ready to offer "help" in return. He mentioned the excellent community outreach by the Model Train folks and the various sports groups. There was really no other way to interpret his comments except that he was unwilling to listen to folks who were not willing to give something in return. That attitude, of course, is typical of the rest of the followers of the current power elite in Costa Mesa. He's basically saying that if you want your ideas included in the final solution to the park update, then you'd better be ready to fork over your time - at least. I thought it was extremely inappropriate and was surprised that nobody challenged him on it. 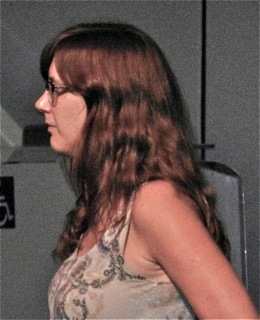 Anna Vrska wanted more data. She felt the need to know with much more specificity the demographic of our sports teams so she could more accurately project future needs. 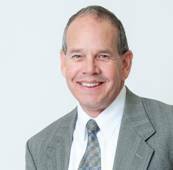 Chairman Richard Mehren requested Public Services Director Ernesto Munoz to provide the committee with use data involving all team sports. Eckles said he has a lot of that data and will present it at the next meeting. The discussion then evolved into a broader discussion of data acquisition and verification. Ron Amburgey made it very clear, once again, that he felt the need for fields was very strong and that he would just disagree with those who felt differently. Munoz gave the committee an overview of the memo from LSA Associates regarding the DG trail and the mapping of all vernal pools. He provided copies of the document to everyone at the meeting and explained some of the choices that were offered to the United States Fish and Wildlife Service in a memo yesterday. He doesn't expect to hear back from USFWS for at least a couple weeks. 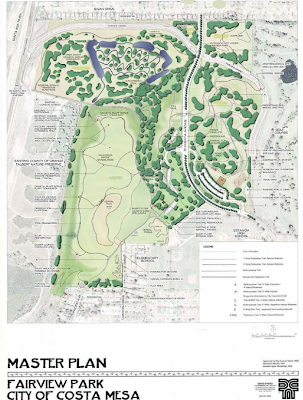 The results of that evaluation will be presented to the committee, then the Parks and Recreation Commission. 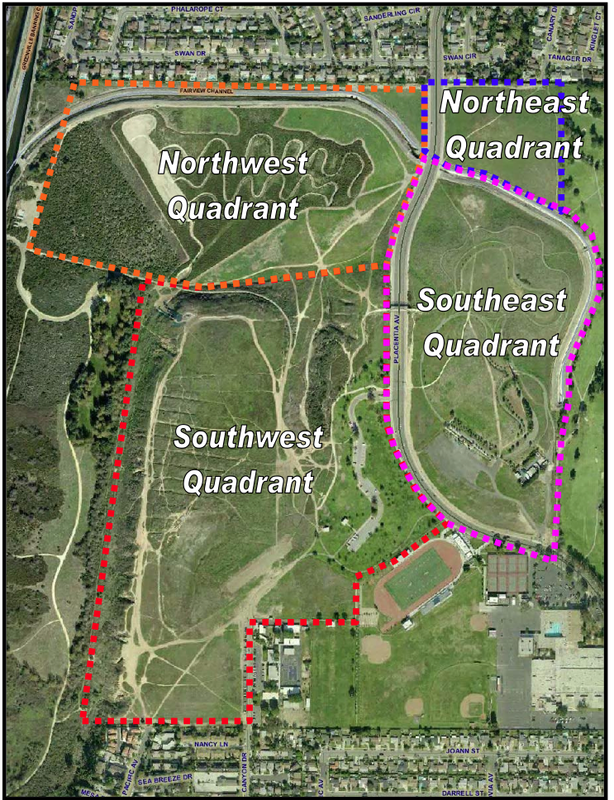 In response to a question by Vice Chair Steve Smith, Munoz affirmed that we would be guided by the decision of the USFWS to perform whatever mitigation of the encroachment of the DG trail into Vernal Pool #6. It seems the two issues swirling around Costa Mesa these days are the 60th Anniversary celebration scandal and the mystery of the decomposed granite path that runs along the fence separating Parsons Field/Waldorf School and Fairview Park. Let's talk about the latter, shall we? I'm in possession of an email thread that provides some clarity to how the user-defined trail evolved into a more than 8 foot wide decomposed granite path that encroaches on a federally-protected vernal pool - #6. What is missing in that email thread is what launched it in the first place and how, and who, eventually installed the DG (decomposed granite). I've been able to fill in some of the blanks. 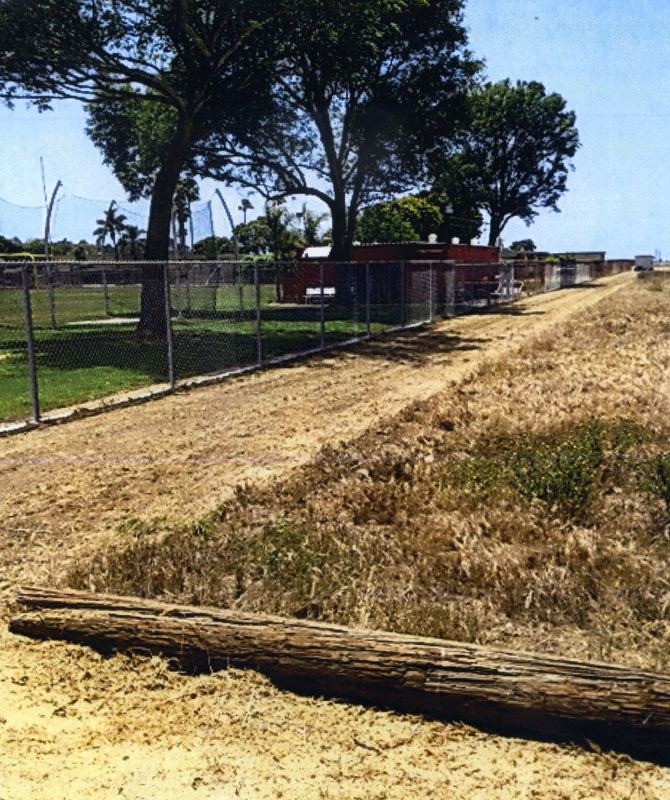 It seems that earlier this spring, in May, Mayor Pro Tem (and Pop Warner Booster President) Steve Mensinger verbally asked Director of Public Services Ernesto Munoz if something could be done to knock down the weeds along a user-defined trail. 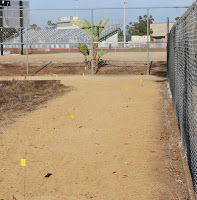 That conversation was followed by a short email from Mensinger to Munoz asking what can be done to move it along, and included a photo of the path(below). Staff replied to Munoz that herbicide had been applied but it seemed to be a less-than satisfactory solution. A week or so later the staffer was able to run a mower over the area to enhance the trail, which now became the approximately 8 foot-wide path shown below. The end of June I received a photograph and correspondence from a park user indicating that this mowed path now had DG installed and wondered if the city did this work, or if it even knew about it. When my correspondent approached the men spreading the DG they were confronted by them, wanting to know why they were taking photos. I forwarded the information to Munoz, who passed it along to the staffer, who subsequently acknowledged the installation of the DG and indicated that we, the city, didn't do it, but whomever did it did a good job on it. In the correspondence there is mention that "Pop Warner Boosters" did the work, but I can find nobody who can confirm that supposition. Unfortunately, the new path - and the mowed path before it - significantly encroached the unmarked borders of Vernal Pool #6. You can see the boundaries marked with yellow flags. In fact, the original trail also encroached on those boundaries, too. 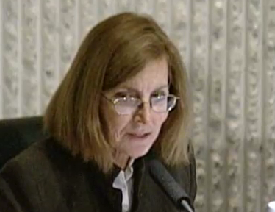 The boundaries were never marked - according to councilwoman Sandra Genis, part of our deal with the federal government was that we would not only identify and protect the borders of ALL vernal pools in Fairview Park, but would also delineate a 10 foot buffer zone around each one to protect them - and that contributed to the encroachment in this case. It seems to me that an error by city staff probably contributed to the initial mowing of the path, which was exacerbated by some group of people who, without permission or permits, overlaid the DG on the newly-mowed path. Unfortunately, neither Mensinger nor those who did the DG work have had the courage to step up and say, "Yeah, I did it!" That's a shame. Now the City is trying to resolve the problem. 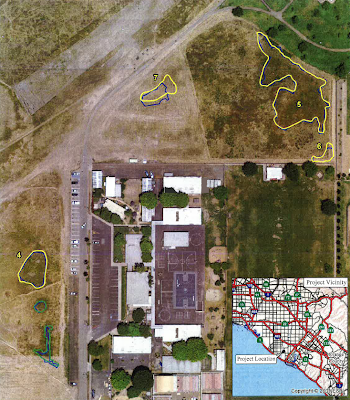 It has hired LSA Associates who has provided a biologist to mark the boundaries of ALL vernal pools presently unprotected on both sides of Plancentia Avenue, including Vernal Pool #6. 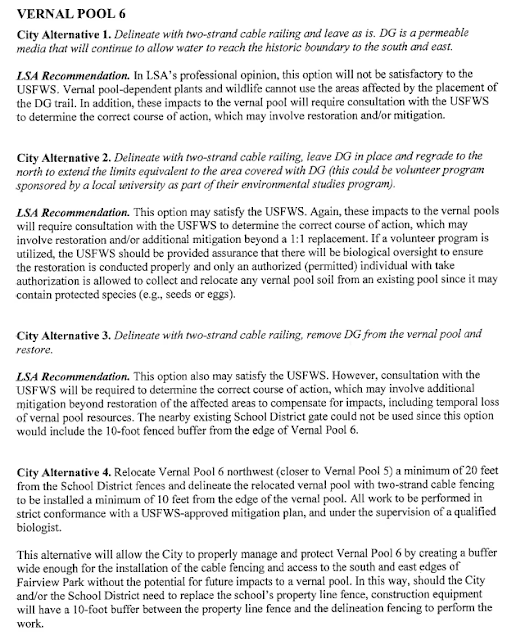 As part of their actions they have prepared a memo to the city which includes four options to the remediation of the encroachment on Vernal Pool #6. You can read a section of that memo in the image below. Click on it to enlarge it. This memo has been sent to the United States Fish and Wildlife Service (USFWS) for their review. Munoz expects to hear back from that organization within a few weeks. At that point, action will be taken based on the USFWS decision to mitigate the damage. Based only on the choices shown above, it seems to me that the better of the four is #4, which involves "relocating" Vernal Pool #6 to a nearby location - probably contiguous with the much larger Vernal Pool #5. That will involve grading the new location to ensure water flows into it, then scraping the dirt which contains the critters presently dormant at that location and transplanting it into the "new" pool. We don't know yet if the federal government, through the USFWS, will seek any kind of punitive damages for the encroachment on the vernal pool. I'm disappointed that this whole thing happened, but more disappointed that our mayor pro tem doesn't have the guts to admit his part in this whole mess. It's hard to measure a man's character while he's on the campaign trail. It's only when he's in office - and in a position to do significant damage - that this kind of thing turns out up. Incidentally, I've heard a rumor that a football booster organization may be offering "preferred parking" at the Waldorf School parking lot for games at Estancia High School, which includes being ferried up the hill to the stadium in golf carts - along that nice, new DG path. I tried to verify that rumor but have had no success so far. If any reader knows more about it please let me know via the email address on the profile page of this blog. 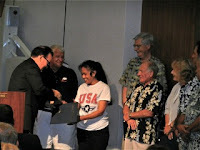 The Costa Mesa City Council surprised even me last night when it managed to drag what probably could have been an hour-long meeting until 9:15 - more than three hours! Geez! It began with some very nice presentations. Mayor Jim Righeimer recognized Bob Robins, owner of Theodore Robins Ford, and his family with the Mayor's award. The dealership has been a fixture in the Newport/Mesa area for nearly a century and in Costa Mesa since 1966. Then he acknowledged the team of volunteers, headed by CMPD Sergeant Vic Bakkila, who recently refurbished and repainted the airplane at Lions Park. 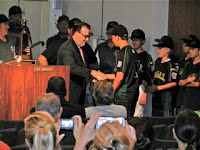 He then recognized the Costa Mesa American Little League organization for their championship season. Finally, he asked concessionaire Hank Lloyd to tell us about the upcoming professional tennis event that will be held in the Costa Mesa Tennis Center soon. Thirteen residents stepped up to express their concerns on a variety of issues. Six spoke with concern about the planned funding of the improvements in Fairview Park near Pacific Avenue. A couple more expressed concern about the difficulty receiving documents dealing with the brewing scandal about the 60th Anniversary celebration and the bootleg decomposed granite trail in Fairview Park. Righeimer kicked off this segment with a monologue about the Group Home issue. 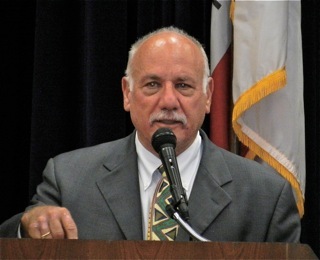 He briefly discussed the Morningside situation in Newport Beach, in which that organization violated their agreement with the City. 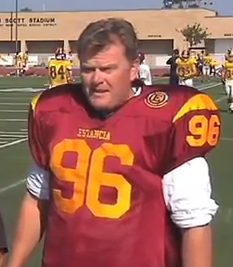 Recent news reports tell us that Morningside has shifted three dozen "clients" to Costa Mesa. Our city now has 24% of all rehab facilities in the county. As Righeimer discussed measures that will be taken to mitigate the impact of these facilities in our neighborhoods he acknowledged that when the proposed municipal ordinances are in place they will certainly result in law suits. It's funny how he just shrugs off litigation as a cost of doing business. He stated, "What does it cost? It costs what it costs!" So, I guess we're supposed to be satisfied that our mayor is willing to expose us to MORE legal entanglements. His casual attitude about racking up legal costs continues to be very distressing. He spoke briefly about the problems with the 60th Anniversary, acknowledging that we can't do much right now because it's a personnel matter. Steve Mensinger opened up his segment with an observation that we're spending a lot of time worrying about a kids pathway - referring, of course, to the bootleg DG path that has recently defiled Vernal Pool #6 and angered the federal agency responsible for it. He said, "I spend a good majority of my time with my family in Fairview Park." Really, Steve? You spend more than half of your time with your family in Fairview Park? I doubt it. Then, in a not-too-subtle attempt to justify his recent call for lights in the park, he said that the Concerts in the Park don't end until dark, which makes it unsafe to depart the park. Director of Public Services, Ernesto Munoz, took some time to explain that we had hired a biologist from LSA Associates to assess the damage the bootleg DG path has done to Vernal Pool #6. All the vernal pools will be delineated, potential mitigation plans will be formed, probably by the end of this week, and the results of the assessment will be sent to the U.S. Department of Fish and Wildlife - the department now responsible for the vernal pools. It will take a couple weeks for Fish and Wildlife to evaluate that information and respond with their demands for mitigation. 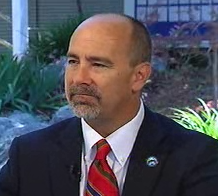 Munoz indicated that, so far, no discussion has occurred about punitive damages for the incursion on Vernal Pool #6. He DID NOT explain who did the installation of the decomposed granite on the path. Sandy Genis expressed concern about the funding for a boardwalk in Fairview Park that is part of the Consent Calendar. She explained at great length about the details of the Conservation Easement that is supposed to govern our actions in Fairview Park. This easement apparently contains an extensive list of banned uses and she's concerned that the boardwalk may violate that easement. She made no bones about how the Vernal Pool #6 encroachment may create long term consequences with our ability manage Fairview Park, indicating that what happened there is not just something to be shrugged off as a "mistake" - it violates an agreement with the federal government. 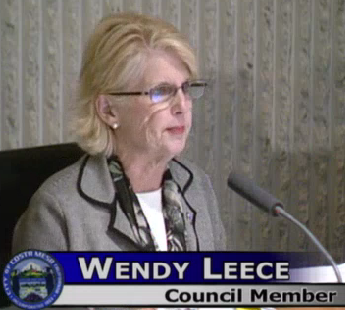 As Wendy Leece began her comments I had to smile as she paused, not saying anything. When Righeimer asked is she was finished she said, "No, I'm just waiting for everyone up here to pay attention." She was referring to Mensinger, who was engrossed in playing Angry Birds or some other distraction, on an electronic device. He continues to demonstrate the attention span of a pre-pubescent teenager. Leece also expressed concern about the boardwalk, and the DG path. She's concerned that we have insufficient park ranger time in Fairview Park. She is also concerned about the potential unintended consequences of the proposed Nuisance Ordinance - the high probability of more legal costs. And, she expressed concern about up-coming police department retirements and our ability to back-fill those vacancies with sufficiently trained officers to keep the city safe. She mentioned the up-coming Citizen's Police Academy that begins in a week. And, she expressed concern about the length of the proposed performance audit for the Costa Mesa Country Club - the item on the Consent Calendar says it will take 13 weeks but the contract is for a year, at a cost of $34,280. Gary Monahan had nothing to offer - big surprise. 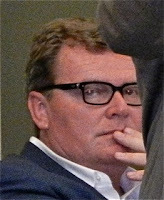 CEO Tom Hatch, probably still reeling following his return from vacation during which the wheels came off at City Hall - the 60th Anniversary scandal and the DG path - explained the reasoning behind the "year" in the agreement for the CM Country Club audit. He also explained that the staff is, and has been, very successful in identifying and acquiring grant funds for improvements throughout the city, and in our parks in particular. Hatch then tossed the ball to Assistant CEO Rick Francis for an update on the Lions Park homelessness situation. Francis was assisted in his presentation by Muriel Ullman, who manages this activity for the city, and CMPD Lieutenant Mark Manley and Sergeant Vic Bakkila. The news was not good. According to the team, despite very significant efforts by the CMPD, the Homeless Task Force and the Churches Consortium to manage the Costa Mesa Homeless, the numbers of homeless folks in our city has actually increased - from 130 to 190, based on a recent census. We heard, for example, that rehab operator Morningside, recently unloaded a failed client to Lions Park. This is the outfit that is leaving Newport Beach for the friendlier confines of Costa Mesa with at least three dozen "clients". During the discussion we learned that, in an attempt to more effectively manage the Lions Park infestation, ALL four of our Park Rangers have been spending significant time at the park - providing dawn-to-dusk coverage - and it seems to have been effective. Citations have more than doubled recently. This pilot program is fairly new. 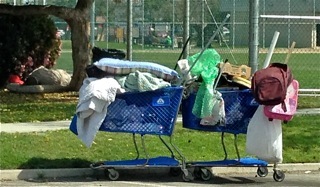 My last pass at Lions Park a couple weeks ago showed more than 20 homeless folks all over the area. The phrase, "carrot and stick" approach was mentioned by Bakkila, who indicated that it's time to use more of the "stick" part of that equation. Despite the increase in homeless folks in our city, there have been some successes by the Homeless Task Force and Becks Hayhoe and her Churches Consortium, and Ullman outlined them for us. While those numbers represented a lot of effort by staffers, social workers and police, they seemed inadequate when viewing this problem as a whole. This is not an easy issue to resolve, particularly when neighboring communities actually send their homeless folks to us because we have an effective infrastructure to manage it. THAT is frustrating. While commenting on this issue Mensinger acknowledged that we have "limited resources' - but neglected to tell us that HE and Righeimer are directly, specifically, responsible for that resource shortage! They refuse to staff the CMPD at levels that will permit effective policing and, for months, refused to let the CMPD hire replacements for anticipated retirements. So, we are far, far, far behind the curve on filling those slots - a fact that will come home to roost the first of the year. 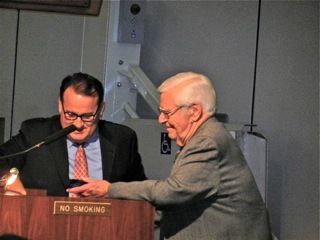 Hatch ended his segment by addressing the 60th Anniversary celebration scandal by READING a prepared statement, which the city has posted on the web site and can be viewed HERE. I understand the need to be accurate, but I was a little uncomfortable that our CEO felt the need to read his statement. It was as though someone else had written it for him... very bizarre. HERE's Bradly Zint's coverage of the issue from the Daily Pilot this morning. When it finally came time to address the Consent Calendar only items 3, 8 and 14 were pulled for separate discussion. Resident Ken Nyquist - a recent frequent commenter here - expressed concern for the mounting legal fees demonstrated on the four warrants. Mensinger pulled #8, the performance audits, because he didn't see any reference to an audit of the two foundations established a few years ago and wanted the staff to look into the agreements. Leece pulled #14, the Fairview Park parking and playground funding. She was concerned about the impact on the neighbors and wondered why we just didn't hold off until the meeting Righeimer planned with the residents that he scheduled off the cuff, from the dais, earlier. Monahan awoke to contribute that this was just a request for permission to seek grant money. It was passed, 4-0, with Leece voting no. And finally, after 9:00 p.m., they got to the only other item on the agenda - Public Hearing #1, a request for vacation of some city property along Fullerton Avenue. As anticipated, this discussion took only moments, but Mensinger went on one of his walk-abouts and was not in the auditorium when the council took the vote to approve the measure, which passed 4-0. Mensinger came wandering back into the chambers after Righeimer had adjourned the meeting to a special study session on September 10th. Mensinger really is obtuse.